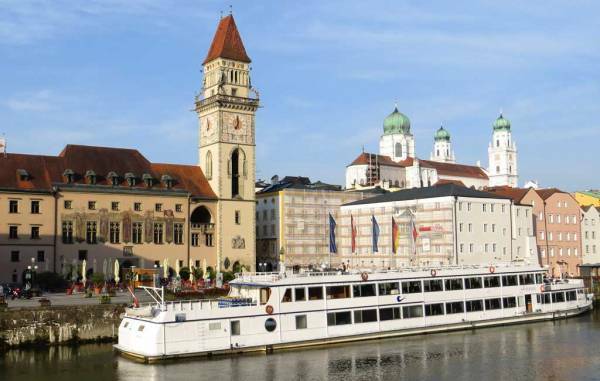 Danube River Cruise - Budapest, Bratislava, Vienna, Salzburg and Passau. We arrived in Budapest for our Danube River Cruise, but didn’t pay for transfers to our Viking Cruise ship. That made things a bit challenging. Hungary hasn’t been approved for use of the Euro, so they use the florint. Very few Hungarians speak English so with a monetary and a language barrier, we opted for the airport shuttle. It was less than $10 per person and quite a long ride. The city was extremely clean land modern looking. The driver didn’t speak any English. After boarding the Viking Prestige, we headed out to walk around the city. Viking docks at the Chain Bridge, which puts them at the center of everything. We walked to St Stephen’s cathedral, the Opera, Gresham Palace, Cafe Gerbeaud for expensive sundaes, the pedestrian way of Vaci Utca, the Parliament and the Shoes Along the Danube. The town was clean and friendly. There were lots of young people wearing fashion designer clothes. In the morning, our Danube River Cruise began with a city tour provided by Viking. First up was Castle Hill, where we visited Matthias Church. It was the church of Hungarian royalty in the past and it was truly beautiful. The 7 towers of the Fisherman’s Bastion surround the church on the river bank. They represent the 7 founding tribes of Hungary. 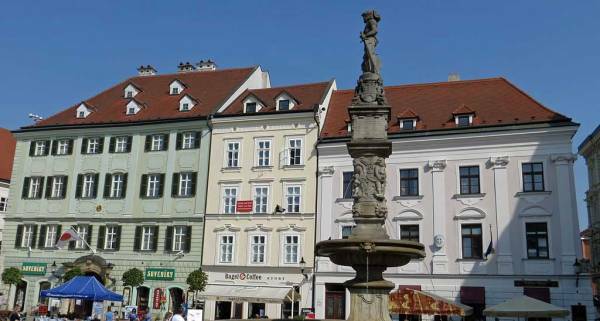 The tour then proceeded to Heroes Square and a drive past the Szechenyi Baths, plus a view of the Dohany Synagogue. Later that day we walked to Cafe Gerbeaud for a fancy sundae and strolled the Vaci Utca pedestrian walkway. The departure of the Viking Prestige just after sunset was spectacular. The ship cruised down the Danube past all the beautifully lit attractions and then we reversed direction to repeat the views going up stream. The Viking Prestige takes nearly the full width of the river to do its u turn. After Budapest, the second stop for the Viking Prestige was Bratislava. This town contrasted sharply with the beauty of Budapest. The city was controlled by Russia after World War II and there modern communist architecture is very dominant in the city. Even the older buildings, such as Bratislava Castle, are plain. The castle is sometimes referred to as the upside down table, because of its 4 spires. Our Viking guide spent a lot of time complaining about what the Russians and modern development had both done to destroy the beauty of the city. The old town was small, but interesting. After the Viking tour, we wandered on our own to find the Blue Little Church. Next we wandered back through the Old Town to eventually reach St Martin’s. This stop was a highlight for me. 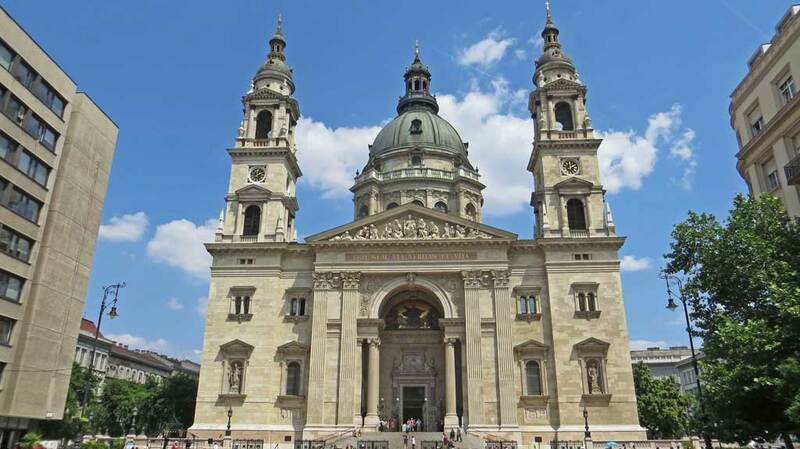 The coronations of Hungarian emperors happened here. The wood work on the pews near the central altar was impressive and eerie. A stairwell led up to a collection of Hungarian imperial jewelry. Another passage led down to the crypts under the church, which was bizarrely interesting. Bratislava definitely wasn’t my favorite stop on the Danube, but we enjoyed the visit. 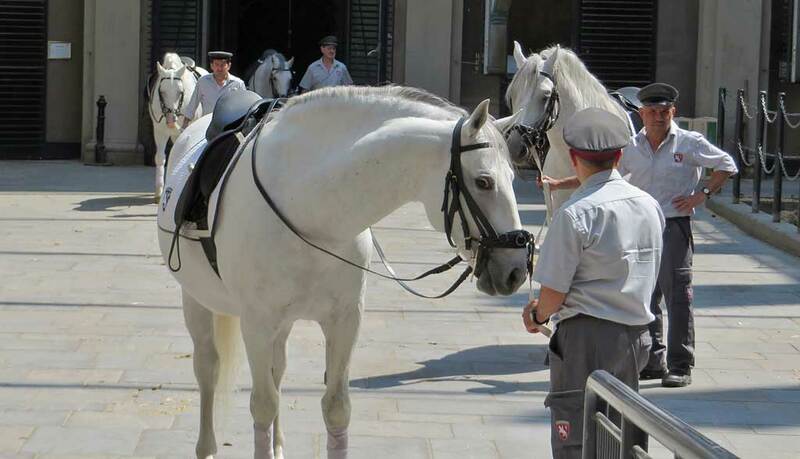 Our third port of call on our up river Viking cruise was Vienna. Dieter led the Viking tour that day and I enjoyed the fast pace compared to other tours. The tour started with a bus ride around the Ringstrasse, which is a series of boulevards that encircle the Old Town. These roads are built where the stone wall fortifications of the city once stood. The buildings are impressive. The Parliament was astounding in both its size and appearance. The town hall is similarly grandiose. The historical atmosphere created by the architecture is everywhere. Next we walked through the Old Town, including the Museum Quarter, the Demel café, the Hofburg Palace and the central focus of the Old Town at St Stephen’s Cathedral. After lunch on the ship, we set out to travel to Schonbrunn Palace on our own. The subway system in Vienna is efficient and easy to use. The ticket machines take coins, bills or credit. From the port it was a quick ride to the Old Town and a few minute wait for the transfer to Schonbrunn. The palace was the summer residence of the Hapsburgs and the extensive grounds give it a similar feel and appearance to Versailles. We skipped the tour of the Palace, as we had seen enough of the décor at Versailles a few days early. Instead we wandered the grounds and walked up to the Gloriette for a view back over the grounds, the Palace and the city. Next the ship stopped at Linz, but we proceeded directly from there by bus to Salzburg. The Old Town in Salzburg consists of three long parallel streets at the base of the protected bank of the river. Our tour started are Mirabel Palace, opposite the Old Town. 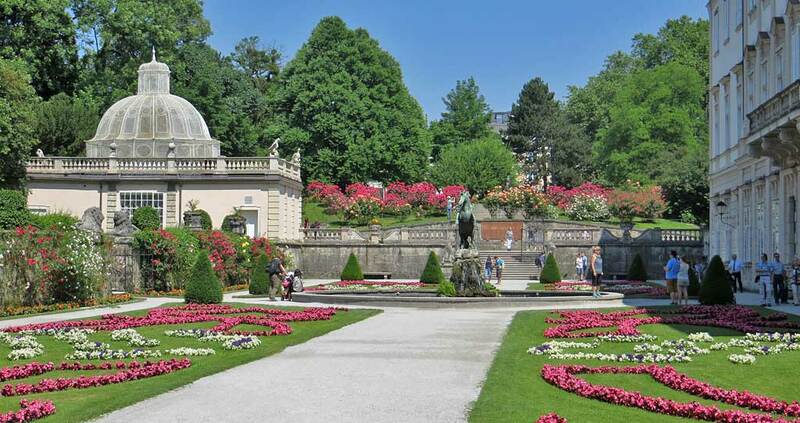 We were quickly introduced to filming locations for the Sound of Music. Our guide explained that North Americans are obsessed with the movie and its film locations in Austria, but Austrians have little interest or even knowledge of the movie. After a guided tour of the old town and its churches, we headed off independently on the funicular to Hohensalzburg Castle. The views and cool breeze were refreshing in the heat of the day. We toured the castle and then spent a long time at the restaurant. Even though the food wasn’t great, it was a wonderful refuge from the heat in the Old Town below. Our Danube River Cruise through the Wachau Valley the next day was picturesque and peaceful. The Wachau Valley views were pastoral and a completely different experience than Salzburg. Our first stop was the village of Dürnstein. About 1,000 people live in Dürnstein, but it has become a busy tourist stop on any Danube River Cruise. The highway and the train line pass underneath the town, so Dürnstein has the feel of an isolated country town. Our Viking River Cruise docked at the downriver end of town. It only took a few minutes to walk through the shops on the pedestrian only main street. Next we had enough time to hike up to the ruins of Burgruine Castle above Dürnstein. The hike up to Burgruine Castle was short and steep. The ruins are rubble and collapsing walls from the 12th century. Legend has it that Richard the Lion Hearted was held here for ransom. The views over the Wachau Valley and Dürnstein were well worth the hike. 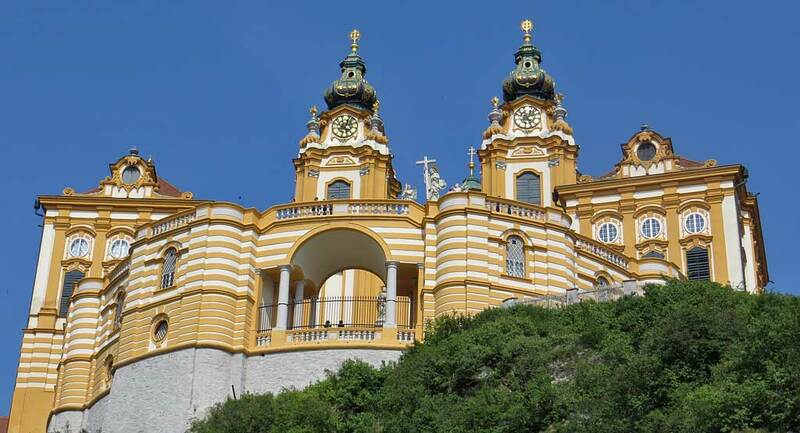 On the same day as our Dürnstein visit, our Viking Danube River Cruise also stopped at the Melk Abbey. 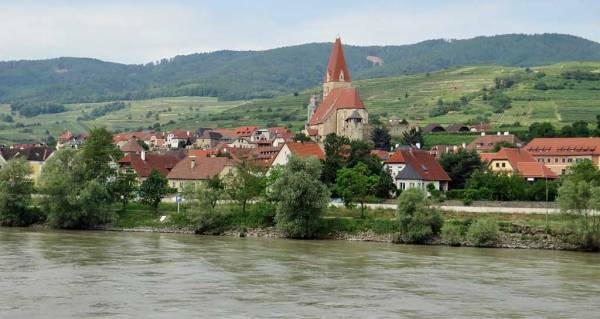 Along the way the village of Weissenkirchen made a great photo that captured why the Wachau Valley is so popular. In Melk, our included tour of the Melk Abbey was impressive. The Melk Abbey is set on a hill overlooking the town of Melk and the surround plains. Melk Abbey seems like it’s larger than the entire town. In the Marble Hall, the fresco on the vaulted ceiling painted by Paul Troger reminded me of the Sistine Chapel. The museum had scriptures and musical scores that were almost 1,000 years old. The Melk Abbey Library was my favorite part of the tour, with its frescos on the vaulted ceiling and the shelves full of old books. The Melk Abbey Church was magnificent, but with an over abundance of shiny metals that seemed somewhat similar to the decoration of a Greek Orthodox church instead of a Benedictine monastery. The spiral staircase between the church and the library was beautiful to look down on from the top. The last stop on our Viking Danube River Cruise was Passau. The early morning approach to the city was beautiful. The sun was behind the ship and provided the perfect light for pictures and views. The ship docked beside the historic old town (Altstadt). Viking provided a walking tour of the town, but we again found the pace too slow and soon departed on our own. We strolled out to the point where the Danube, Inn and Ilz rivers merge together. We also checked out St Stephen’s and St Paul’s. After that we wandered to the train station to purchase tickets for the next day, which was the start of our 8 day train trip through Switzerland. Our Viking Danube River Cruise was a big success.